The elliptical framed painting logo used by Historic Brighton, in our newsletter & website, is a copy of an oil painting by George Herdle, owned by the Rochester Memorial Art Gallery and believed to represent a scene along the Erie Canal. 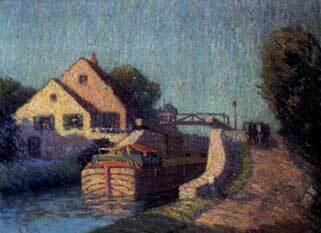 Brighton was a major port on the Erie Canal, and the use of this painting seems very appropriate as a visual image to depict our history. Our community came to life with the 1823 canal opening and supplied many of the talented contractors who designed, constructed and operated the canal system. Brighton Village was a major port on the Erie Canal and within that area of the Village there were five locks to be viewed. All within easy walk from the Memorial Art Gallery on University Avenue. George Herdle, the first director of the Memorial Art Gallery. He was a museum director, craftsperson & painter from Rochester, NY. He studied in Paris and Holland and was a member of the Rochester Art Club, Rochester Municipal Art Committee, Association Art Museum Director. He exhibited at the Boston Art Club in 1873; PAFA, 1906; AIC, 1907, 1911; Corcoran Gallery, 1908 & 1910. The Memorial Art Gallery of Rochester has granted permission to Historic Brighton for use of the image in our headline setting on our web site pages. Our many thanks!